If Grandma's gorgeous emerald band or the cool wooden ring on sale at the local antique shop is too small for your middle finger, at least it can fit on your pinky. But when a pinky ring proves too small, it's easier to gift it to someone with smaller fingers than it is to get it fixed. Rings can be made smaller much more easily than they can be expanded. To make sure you can actually wear the ring you're eyeing, take a few measurements first. Wait to measure pinkies until the end of the day. If hands are cold, rinse them under warm water first. Fingers shrink in the cold so measuring a chilly pinky may result in ordering a ring that's too small. Wrap a piece of string or dental floss – or a strip of paper – around the base of the pinky finger. It should be wrapped snugly but not actually press into the skin. Mark the string or paper at the place where the two ends meet and use a ruler to find the distance between those points in millimeters. Repeat this process twice to make sure the number is accurate. Measure both pinkies if you plan to switch the ring between hands; it's uncommon but possible to wear different ring sizes on different hands. 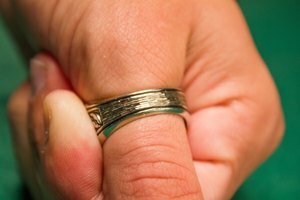 If the knuckle of either pinky is larger than the base, take the knuckle measurement to find the smallest size of ring that will be able to slip past it. 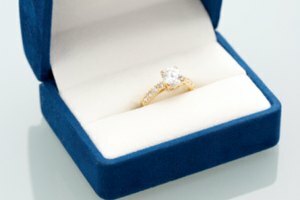 The easier way to find a ring measurement is to find a ring you already own that fits the pinky perfectly and check it against a ring-size chart. Many major jewelry chains provide printable charts on their websites. Follow the printing instructions to make sure the chart's images are true to size and find the circle on the chart that most closely matches the inside circumference of the ring. Using a ring chart takes the guesswork out of finding a ring size, especially because there's no easy-to-memorize trick that works for converting measurements to sizes, and there's only a very small difference between consecutive sizes. 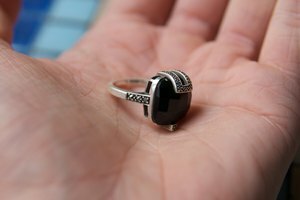 For instance, a size 4 ring has a circumference of 46.7 mm, and a size 4 1/2 ring has a 48 mm circumference. When the measurement of a pinky finger falls in between two sizes, opt for the larger size. Whatever pinky ring you love is the one to get, but do consider a few things when making the selection. Because the side of the ring is exposed on the outer edge of the hand, pinky rings with all-over crystals, spikes or accents are a little more likely to snag on clothing than rings worn on other fingers. Typing or writing by hand may also be uncomfortable while wearing a chunky pinky ring. Play it safe by picking something smooth and understated for this particular finger.